Josh Bolton and Lynn Novick are our guests this week. Joshua Bolten served as Chief of Staff (CoS) to the 43rd President of the United States from April 14, 2006 to January 20, 2009. The hand-off from one Chief of Staff to the next. On this week’s show he shares his survival strategies for Washington’s toughest job. Some have described the CoS role as ‘Deputy President’ but Josh Bolten sees it very differently. In this rare interview we discuss how polioptics figures into the CoS role at nearly every turn and how the President’s frequent role as Consoler-in-Chief can make or break faith with the American people. Those of you who know Josh King know that life changed for him in 1990 with the debut of Ken Burns’s THE CIVIL WAR. Finally, he had what he always wanted: The Killer Angels — and a lot more — brought to life in nine episodes spanning from Harper’s Ferry to Appomattox Courthouse. Indeed, for Josh, his first generation VHS edition of the Burns classic is the only reason he still keeps an analog VCR hooked to his 62-inch high-def plasma. The superb storytelling that is the hallmark of any material that comes forth from Burn’s Florentine Films, based in bucolic Walpole, New Hampshire, represents the height of Polioptics — the melding of factual content and audio and visual elements that heighten the impact on the audience member. What worked for Bill Clinton works on viewers of PBS. So it should come as no surprise that the best known successors to that Burns film — BASEBALL, FRANK LLOYD WRIGHT, JAZZ and THE WAR — would also claim shelf space in the King video library. What’s more surprising to some, however, is that for many of the Burns blockbusters he has shared directing and producing credit with Lynn Novick, a gifted but humble filmmaker who leveraged a job working at the Smithsonian out of Yale into that most elusive of lifelong great gigs: the job of bringing American history to life thanks to the generosity of underwriters and the airtime of the Public Broadcasting System. For anyone who found the Autobiography of Ulysses S. Grant or the Rise and Fall of the Third Reich a tad too ponderous to peruse cover-to-cover, there are the works of Burns and Novick — the combination of facts, analysis, archival photography and footage, arresting music (there’s no duo quite like Jay Ungar and Molly Mason) and lush cinematography that makes twenty hours pass like twenty minutes on a weekend in front of the tube — perhaps with a pause for a Sam Adams and a quick siesta. Who could forget the David McCullough introduction of Sullivan Ballou’s letter to his wife, Sarah, set against the strings of Jay Ungar and Molly Mason playing the Ashokan Farewell? Surely, one of the best letters ever written, augmented by production values that enhance its timelessness and render it unforgettable. Now, with BOARDWALK EMPIRE beginning its second season on HBO, a new generation of armchair historians are scratching the surface of a mythologized and misunderstood era when America tried to legislate morality in the form of the Eighteenth Amendment to the Constitution of the United States: PROHIBITION. 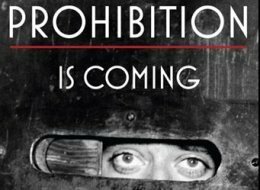 The story of Prohibition is the story of unintended consequences. In classic Novick and Burns tradition, characters from the age are brought to life through the voices of Hollywood’s most revered actors, including Tom Hanks, Patricia Clarkson, Samuel L. Jackson, John Lithgow, Philip Bosco, Blythe Danner, Paul Giamatti, Amy Madigan and Oliver Platt, among others. In addition, Novick and Burns use the authoritative voices of people like newspaper columnist Pete Hamill and historian Michael Lerner to play the sage role of chronicler that Mike Barnicle and Shelby Foote played in previous films. Enjoy the HBO series for what it is: fine acting, rich scoring, glamorous costumes and gorgeous entertainment. But for the real story behind the matte paintings, read Daniel Okrent’s book, Last Call, the Rise and Fall of Prohibition, and see the documentary by Lynn Novick and Ken Burns, beginning Sunday, October 2 at 8:00 pm, and available for download and DVD shortly thereafter.